What’s the big deal about body hair and skin markings? I recalled that this whole book’s purpose was for the Israelites to be holy as their Lord was holy—in other words, to be different because the Protagonist was different. 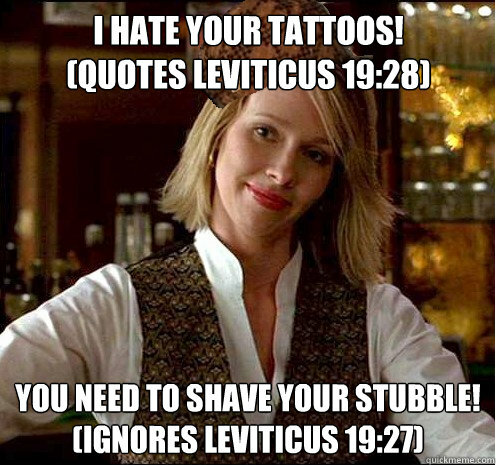 So what was it about body hair or markings on the skin that the Protagonist wanted the Israelites to set themselves apart from? What culture was so displeasing to the Protagonist that the Israelites were to be completely different from them? Let’s start with the beards and the hair. According to certain historians, the time period of Leviticus can be set between 1495 to1455 BCE (Bible World History). Coinciding with this was the Dynastic Period of Egypt, in which body hair was a big deal. The priests of Egypt saw body hair as unclean (History of Shaving), which would be an offense to the gods, so it was entirely shaved off. Even the pharaoh removed parts of hair, regulating his beard shape. The people of Egypt spent a great deal of time and effort policing their body hair (Art of Manliness). Now if I were the Protagonist who wanted to have my people, the Israelites, set apart, wouldn’t I want for them to stop using the cultural norms of another people, especially the people I had just rescued them from? By not marring the beard nor shaping the hair at the temples, the Israelites would be distinguishable from the Egyptians, their former enslavers. In addition, the Israelites’ less rigid depilation schedule freed up time to focus their attentions on all of the other rules of the covenant. Hebrews = the Duck Dynasty of their generation. As for tattooing, this again could be tied to the Egyptians. Amunet, a mummified priestess of Hathor, was discovered with extensive tattooing around her lower abdomen and on her arms and legs (Tattoos of the Egyptian World). Hathor, the goddess of fertility and sexuality, is believed to have been honoured by the tattooing of Amunet. Though not widespread, the tattoos of the Egyptians seem to have been a form of ritualistic practice to celebrate the gods (Tattoo Temple). Tattooing was considered a mark of slavery or submission to a deity, so it is obvious that the Israelites were to avoid this form of dedication to a false idol (Jewish Virtual Library). The people of the Protagonist were to be dedicated only to Him and His covenant, not to the gods of a bygone era of their lives. To continue the idea of marking the body, Leviticus states that the Israelites may not cut their bodies for the dead. The Amorites were a culture who often cut their flesh if a member of their household had died (Torah Insights on the Weekly Parsha). The Amorites, a Semitic tribe, were extremely well known for their military prowess, as they helped contribute to the downfall of the Sumerian empire’s Ur (Egypt Origins). They also worshiped a god other than the Protagonist (Who Were the Amorites). Obviously, the Protagonist isn’t going to allow his chosen people to align themselves with another culture’s religious practices or to seek out human glory over revering Him. The Protagonist set the rules of the covenant before the Israelites in Leviticus to differentiate them from the surrounding cultures of the area. By following these rules, the Israelites would be holy as their Lord was holy, and then gain the benefits of being in a contract with the Protagonist: as a nation, they are promised a fruitful existence protected from their enemies.